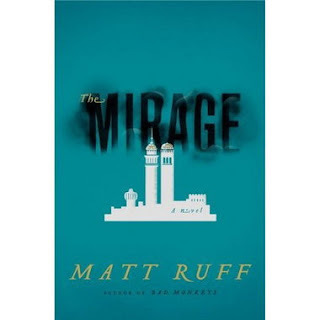 I recently read Matt Ruff's novel, The Mirage . The United Arab States declares a War on Terror. Arabian and Persian troops invade the Eastern Seaboard and establish a Green Zone in Washington, D.C. . . .
Summer, 2009: Arab Homeland Security agent Mustafa al Baghdadi interrogates a captured suicide bomber. The prisoner claims that the world they are living in is a mirage—in the real world, America is a superpower, and the Arab states are just a collection of "backward third-world countries." A search of the bomber's apartment turns up a copy of The New York Times, dated September 12, 2001, that appears to support his claim. Other captured terrorists have been telling the same story. The president wants answers, but Mustafa soon discovers he's not the only interested party. Those of you who frequent the blog know that I'm an evangelical Christian... people who don't know the terms well might even call me a fundamentalist. I'm conservative theologically, certainly, and you might expect that a novel about fundamentalist Christians acting as terrorists in a united middle east would cause problems for me. But you'd be wrong. By turning the entire world upside down and turning the Middle East into a world power and the U.S. into a continent of contentious nation states, Matt Ruff has created a novel of unexpected power that both entertains the reader and illuminates the current world. More than once I experienced a feeling of vertigo (as, indeed, the characters in the book do as well) which caused me to put myself in the place of the Christian terrorists and say, "I can see where that would seem reasonable from their point of view." The book is meticulously researched, reasonable in its world-building, and a fascinating study of what drives us to do what we do in society, in war, in government and even sheds light on the reasons that terrorism seems not only reasonable but righteous to those who choose that path. The book doesn't settle for easy answers. The "American terrorists" and their governments are not the bad guys in the story. In fact, one theme of the book is that evil people remain evil despite the situation, and many of the men you'd expect to be evil given their actions in this world are evil in "the mirage" as well... it just comes out in a different way because they are already in power, not trying to attain it. Much of the driving force of the novel is about trying to get to the bottom of this "mirage" conspiracy theory... is it true or an urban legend? If it's not true, who is producing these "artifacts" from another world where the U.S. is a world power? And why are the big players in the United Arab States , like bin Laden and Hussein, trying to prevent Arab Homeland Security officer Mustafa al Bagadi and his team from discovering the truth? This novel could have been all flash and concept driven, but Ruff did the extra work of writing characters we care about, each of whom is going through his or her own personal crisis in the midst of this situation. I don't want to give too much away, but by the end of the book I cared more about what would happen to Mustafa and his team than I did about the nature and origin of the mirage. Regarding the mirage... I couldn't imagine a solution to this question that would be satisfying, but Ruff pulled it off. I was pleased by the underpinning realities of the mirage and how he worked it all out. The only thing about this book that bothered me at all (and this was slight) was that the sly references to how the world had changed sometimes had more to do with having a laugh than advancing the story or world building (for instance, there is an Arab version of 24, with its own Jack Bauer). Also, I couldn't figure out why none of the "real world" U.S. presidents or vice-presidents were called by their name, when everyone else in the book including Donald Rumsfield are called by name. It was distracting. Oh, given my audience here I should probably mention that there is some violence in the book, and some strong language. So, all that to say: I enjoyed this book immensely. It was surprising, insightful, entertaining, and, yes, moving. I found myself thinking about it when I wasn't reading it, and telling people around me that they should read it as well. This now includes you: go read this book. Buy The Mirage on Amazon. Read a free PDF excerpt from the book. You can also follow Matt Ruff on twitter.